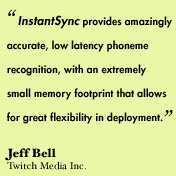 InstantSync automatically detects and marks phoneme events in an audio stream. 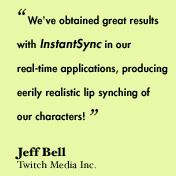 The output of InstantSync allows for automatic lip synchronization in real time for streaming audio applications. InstantSync allows an animated characters lip movements, facial expressions, and gestures to be automatically aligned and synchronized to its voice track. Facial capture for real-time motion capture systems. Output time resolution is 10 ms. Very fast: requires less than 2% of CPU power to process a real-time audio stream on a 3GHz P4. Very compact: executable footprint is as small as 150k. Accurate mouth positioning for real-time audio streams. Synchronizes two-way chat applications, and other applications involving live voice data. Brings previously static characters to life! Better and faster reuse of graphic assets by simplifying the process needed to introduce new audio content for a given character. Substantially more realistic than simple mouth-flap approaches.